This week we have some more July & August mysteries from Penguin authors-Addressed to Kill: A Postmistress Mystery by Jean Flowers, Sowed to Death: A Farmer’s Daughter Mystery by Peg Cochran, Muffin to Fear: A Merry Muffin Mystery by Victoria Hamilton, A Tangled Yarn: A Yarn Retreat Mystery by Betty Hechtman, & Chime and Punishment: A Clock Shop Mystery by Julianne Holmes. Details at the end of this post on how to enter to win a copy of all 5 books, along with links you can use to purchase them. As the lone postmistress of North Ashcot, Massachusetts, Cassie Miller had thought that her biggest challenge would be dealing with Valentine’s Day, the post office’s second busiest day of the year (second only to Christmas). Promoting the spirit of the season, Cassie has agreed to allow the local amateur musicians, the Ashcots, rehearse for the Valentine’s Day dinner dance in the office’s community room during closed hours. It was after one of their rehearsals that a very cranky Dennis Sommerville came to her counter complaining about threatening letters from his students. Cassie didn’t think that anonymous notes warning the physics professor that he would be reported to the college oversight committee amounted to an actual prosecutable threat, but it’s an opinion she’s willing to revise when Dennis is found murdered in his home. Bearing a tremendous amount of guilt for not investigating the letters, Cassie feels compelled to investigate the reasons why the academic ended up dead. A string of home robberies in town at first seemed to her biggest lead, but that’s quickly set aside in favor of the rampant egos and strife prevalent within the college. It seems that battles continually wage between the Math and Physics departments, with warfare being conducted through course catalogues, required classes, and syllabi. Chief of Police Sunni Smargon may raise an eyebrow at Cassie’s need to ease her conscience, but the resourceful and engaging postal worker will prove relentless and skilled at tracking down the final clues leading to a murderer. The prolific author of numerous mystery series written under her name Camille Minichino, she once again crafts an elaborately plotted and compelling puzzle for readers. The unexpected highlights are the quirky stories and history behind the United States Postal Service. From the most unusual items mailed—there is a standard to the number of allowable honeybees—to the unacknowledged role of women in its workforce, details are sprinkled throughout without interrupting the flow of the novel. Not only is the post office a place for the locals to gather, gossip, and share news, it remains an extraordinarily efficient and inexpensive form of communication. Even in this age of email, Instagram, and texting, the Federal Office remains a force to be reckoned with through its investigative powers and resources. Cassie’s obvious dedication and loyalty to the standards of the Post Office make her all the more admirable, especially since she left Boston to return to her small town. 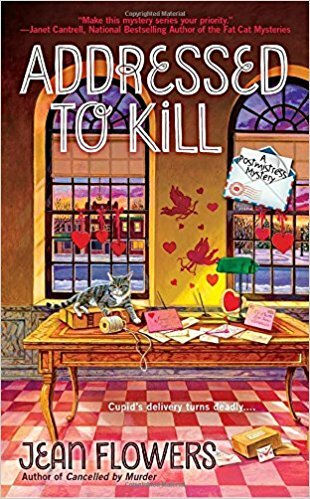 That this author continues to deliver so many original, timely, and very entertaining cozy mysteries is both an achievement and a welcome delight. Camille Minichino’s PhD in physics does make her choice of a victim an intriguing one, and one can’t help but wonder if there’s a little vicarious thrill involved. If the real world of the academia is anything like the nefarious, ego-driven, backstabbing one presented here, no one would blame her. In Lovett, Michigan, the country fair is a big event. It’s all about cotton candy, winning a stuffed animal, and judging baked goods. A demonstration of the Jaws of Life by the fire department is icing on the cake, so to speak. Shelby McDonald is a food and lifestyle blogger. She’s entered jams and jellies made from produce she’s grown at Love Blossom Farm. Although the possibility of winning a blue ribbon is high on her list, seeing her neighbor wield the rescue equipment to save a crash test dummy rates right up there. Her daughter, Amelia, is a teen now and volleys back and forth between typical teen angst and the sweet kid she was. Billy is younger, dirtier, ever on the move, and still a joy. Since her husband died, Shelby’s been strapped for money. She trades produce with other farmers, sells eggs, works the farmer’s market crowd with her homegrown herbs, and still worries if there’s enough gas in the truck for another trip to town. The judges are sampling the pies submitted when one of the judges gasps and can’t breathe. It’s the firemen to the rescue. It seems someone spiked the pie, usually the judge’s favorite. After that excitement, it’s time to see the Jaws in action. Instead of the dummy in the car, a body falls out. It’s Zeke Barnstable, a local farmer. Zeke has had run-ins with several people lately, including Jake. There’s also the matter of Zeke’s wife disappearing a couple of years ago. Some say she ran off with another man. Some believe Zeke killed her. Whatever happened then, Zeke’s death is definitely murder. Shelby loves a mystery but her brother-in-law, Frank, the police chief, doesn’t always appreciate her help. Unfortunately, Jake is one of the suspects since he’d had words with Zeke. Shelby decides asking a few questions can’t hurt. In her personal life, things are hectic. With the help of Bert, her good friend, she’s got a babysitter when needed, help in the kitchen for canning, and a listening ear when solving problems. Her love life is getting complicated, and she’s not even gone on a date yet. To distract her mind from that, she focuses on the murder, the spiked pie, and the women fighting over the recently widowed pastor. This is the second book in the Farmer’s Daughter Mystery series. Shelby has remarkable patience, more energy than ten people who have “real jobs” and a knack for finding out the truth. She’s ferocious where her kids are concerned. Although she may think she’s not ready for a relationship, she’s giving it some thought which is a move forward. There are three obvious candidates. She’ll have a hard time deciding once she’s ready. 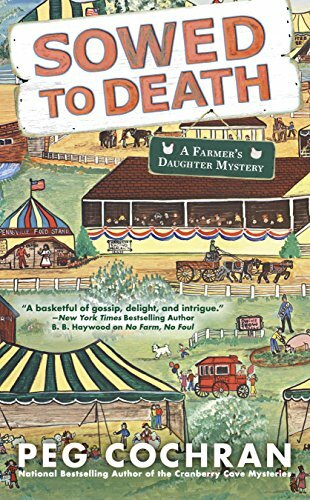 For a glimpse into farm life reality, the joys and tribulations of living with a teenage girl and a boy who knows no fear, and a murder to solve, this is just the ticket for a summer read. Cochran also writes the Gourmet De-Lite series (3) and the Cranberry Cove mysteries (3). Merry Wynter is home from her honeymoon with Virgil. She’s rested, refreshed, and ever so in love—until she sees the crowd of people at Wynter Castle, the enormous place she inherited from her uncle. Her friend, Pish lives there too. He saw mysterious shadows, heard whispers and a few things seemed to move themselves around. He called a ghostbusters-type television show to ask for advice. It seems there was a misunderstanding, and they thought he invited them to come investigate. Merry’s got more patience than most people and takes it in stride. The on camera personalities and crew who seem to squabble, make up, and shift from enemies to best friends and back again in no time at all. Lizzie, Merry’s teenage friend, is thrilled. She loves anything to do with a camera. There are two psychics in the show too. Most of the time, it seems like they’re just there to ham it up for the cameras with fake fainting spells or arguing with unseen ghosts about leaving the premises. Dirk is thoroughly unlikable by anyone who meets him, and he seems to like it that way. Millicent believes she has some ability but is willing to exaggerate when needed. Two of the original members of the show are die hard believers and hate the idea of psychics. Still, without ratings, there’s no show. There’s constant chaos as two affairs, multiple disagreements, and hundreds of feet of electrical cord take over the castle. When a body turns up, it’s apparent that the killer must be one of the TV crew or cast. The arrangement with the show is to talk about ghosts from past deaths. When members insist on talking about recent murders, Merry has to draw the line. Merry’s got some secret plans of her own going on and she’d like nothing better than to kick the whole crew to the curb. Unfortunately, the new Sheriff has told them to stay put until the killer is found. With the help of Hannah, the librarian, Lizzie, Virgil and Pish, Merry is determined to get to the bottom of the mystery and on with her life. Although Merry is busy day and night, she’s shared recipes for gluten-free pecan pie muffins, hot chocolate muffins and Virgil’s chili con carne. He likes it spicy, but she’s toned it down. 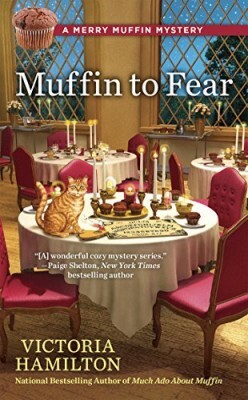 This is book five in the Merry Muffin Mystery series. Characters are well developed with interesting lives, even Beckett the Cat. Readers will look forward to what’s next for Merry and Virgil. Things are changing rapidly at the castle. It will be hard to wait for the next book. In the meantime, try those recipes! At the Vista Del Mar, it’s time for another yarn retreat. Not to be outdone, the Vista’s manager, Kevin St. John has planned one of his own for writers. He hopes to be so successful, yarn retreats will become a thing of the past. Casey Feldman inherited the business from her aunt. Casey’s new to knitting and crocheting, but she’s learning more than she realizes. With the help of Bree, Scott, and Olivia who were at her first retreat, and Lucinda, who lives in town, she’s able to keep the events interesting. Of course, interesting means more than arm knitting or finger crocheting. It also includes murder. Thankfully, this time the victim is not a member of her group but is one of Kevin’s which puts him in an understandable panic. Casey has helped with investigations in the past and with great success. This time she has no reason to be involved, until Madeleine Delacorte, one of the owners of Vista, fears she’ll be a suspect. Her younger sister, Cora, is very proper and thinks Madeleine has gone over the edge. After all, she’s wearing blue jeans, taking knitting classes and traveling alone! These things are Just Not Done by a Delacorte!The sisters are past retirement age but were protected and made aware of their status in town by their parents. At Madeleine’s urging, Casey asks questions with little results. There are so many suspects it’s hard to choose just one. In a surprising twist, the chief of police asks her for a bit of help. He’s been against her involvement in the past so this is shocking indeed. On the personal front, Casey’s mother is easing up on the pressure to move back to Chicago, to go to culinary school in Paris and/or to marry Dr. Sammy. Although Sammy has a busy practice, his true love is magic. It seems he now has an assistant, and Casey’s not sure just how she feels about that. Dane, a police officer who lives near Casey, is definitely interested in her and sparks fly when they’re together. It’s much easier to concentrate on yarn and murder. This is the fifth book in the Yarn Retreat Mystery series. Characters are settling in and mellowing. The retreats always have glitches, but in the end, everyone enjoys them. Casey also bakes muffins for restaurants in town and shares new recipes like her latest, almost apple fritter muffins. Wanda, one of the instructors for the workshops shares a knitting pattern that’s not only easy to do but adaptable to make a washcloth, baby blanket, or a shawl. The Vista Del Mar is a great place to visit except be warned. It’s unplugged, so no cell service, no phones in the rooms, no television, no WiFi. Hechtman also writes the crochet mysteries featuring Molly Pink. There are eleven in that series. For patterns, recipes, murder, and mayhem, Hechtman delivers every time. The Cog and Sprocket, the clock business Ruth Clagan inherited from her grandfather, is gaining in popularity, thanks to the social media skills of Nadia. The clock tower, burned and destroyed years ago, is now being refurbished by Ruth and a host of helpers, including Pat and Zane who work in the shop. Pieces are duplicated with some modern improvements while maintaining the integrity of the clock. It will have dancing figures that come out when the bell chimes. The bell—it’s lopsided and not up to standards, but it was donated and funds are tight. There will be time to replace it later. The townspeople are excited at the prospect of more tourists as well as restoring a piece of history—except for Kim Gray, the town manager. She should be pushing the project but instead, tries to sabotage progress of any sort at every turn. Just when it seemed like the town council had the votes to fire her, she won an unexpected ally who tipped the vote in her favor. It was by secret ballot so no one knows who to blame. There’s an open house planned so people can see the work behind the scenes. There are clock weights, the bell, wood stains, and more to see while employees and volunteers explain the workings. Kim would have probably boycotted the event, but the press would be there and she never misses a photo op. Ruth is more than surprised when Kim isn’t there on time. Kim’s body is found after it’s almost over. Luckily there were cameras recording the party but none where she was killed. Everyone took photos too. It’s possible to narrow the suspect list from all those who hated her to those who hated her and had the opportunity for murder. Ruth’s love life with Ben shows a lot of promise until his ex-wife shows up. Ruth can’t complain too much as she’s just received a letter from her ex. Neither of them has talked about their lives before and now it’s time. Ben’s Aunt Flo was supposed to have retired as the town’s hair stylist, but she’s finding it hard to do. Ruth’s BFF Moira is dating Jeff, the police chief. That relationship threatens to derail when he takes Moira’s mother in for questioning in Kim’s death. Under a deadline to not only finish the clock but to set her relationship on sturdier ground and solve a murder, Ruth hardly has time to sleep. 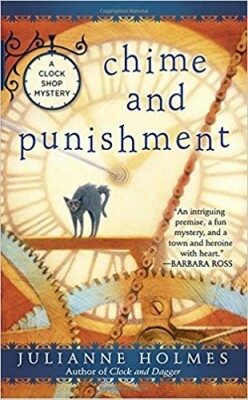 This is the third book in the Clock Shop Mystery series. It’s fun to see how each character finds what is really important and how to achieve the dream. Ruth and Ben, Moira and Jeff—the love lives are unfolding nicely. Ruth is seen as the catalyst who brings the town together, whether she thinks so or not. Readers will look forward to what’s next in personal lives as well as professional. To enter to win a copy of all 5 books, simply email KRL at krlcontests@gmail[dot]com by replacing the [dot] with a period, and with the subject line “july august,” or comment on this article. A winner will be chosen September 9, 2017. U.S. residents only. If entering via email please include your mailing address, and if via comment please include your email address. Death of a Red Leather Mary Jane. At last, she’s achieved her dream of a book of her own on Kindle–and all the other e-readers–with the publication of From Hay to Eternity: Ten Tales of Crime and Deception, a collection of short stories published by Untreed Reads. Her Westie-ish dog, Ozzie, begs you to buy a copy. It’s only 99c and he needs more toys. Thank you once again, Cynthia, for your great service to writers and readers! I hope all is well with you. Oh, my goodness!!!!! Every one of these sound absolutely WONDERFUL! Nice reviews! Two new to me authors! Look forward to reading these. Thanks so much for the chance to win these books. They all sound like good reads. I’d love to read these books. Thanks for the opportunity! I love all these series !! Hope to win. Thank you for the opportunity and your generosity. So anxious to read all of these! Thanks for the chance to win! I am so looking forward to a chance to win! All new authors for me to read, and reading is my favorite thing to do! Thank you for the opportunity! They all sound like great reads!! Thanks for the chance to win.. WOW!! All 5 are on my wish list. Please add me to the draw. What a wonderful array of authors and their books. Such an interesting write up of each as well. It would be terrific to win these as I have not yet bought any of them. Thank you for the chance to do that. Congratulations to each author on their releases. Hi! I would love to win these books. I see a couple familiar authors and a couple new to me. The covers are all great, but I’m esp. partial to a cover with a cat on it. Sometimes when I’m browsing the bookstore or library shelves I pick a book just because there is a cat on the cover. I love cozy mysteries ! So excited to read these books! Great giveaway! I would love to win these. Never read one, not sure I know the authors, but covers are amazing. These 5 cozy mysteries mean days of reading enjoyment! I would love to win a copy of these books. They all look like wonderful read. 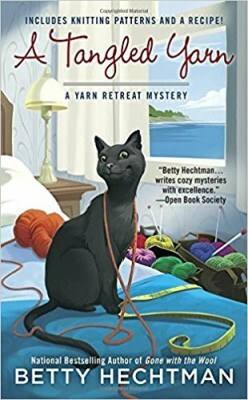 I love the Yarn Retreat series by Betty Hechtman. They are wonderful. These all look great, would love a chance to read. I’ve seen all of these and wished I had them. What a great prize! There is nothing better than cozy mysteries. These all look great! I would love to win! Thanks. Would love to win these books! but some really good ones to add to TBR regardless! These all sound like great reads. I’d love to win. What a fabulous gathering of books…and a great article. Thanks! Sounds like great books. Thanks for a chance to win them. Awesome giveaway! Great way to spend some time – reading great books! Thanks for some wonderful reviews. Can’t wait to read all of these. They all sound like wonderful reads – thanks for sharing with us! What a great selection of books from a great selection of authors. Would love to read all of them. Thanks for the chance.